Last breakfast at the headquarters of the Banihal-Qazigund tunnel project, where engineers are working round the clock to dig through two parallel 8.5-km tunnels, is served early in the morning to ensure that engineers and supervisors are at the site as the shift begins at 8 am. As the sun comes up behind the mountains, oversize machines enter the tunnel from the two portals at Banihal and Qazigund sides. These ‘boomers’, with computerised controls, are specially designed for the job as it is too risky to deploy tunnel boring machines in the Himalayas. The battery of engineers keeps working at it round the clock, breaking only to change shifts. “Meeting the engineering challenge is only a part of the difficulties. The tricky terrain makes transportation of the equipment and material to work site difficult and severe winter and snow fall restrict working time,” says P Satyanarayana, general manager of Navayuga Engineering Company that is constructing the tunnel. To ensure uninterrupted work, the company has provided facilities for lodging and feeding supervisory staff as well as workers at the work site, he adds. The expenses incurred on high technology and special facilities to the staff and workers have pushed up the productivity at the working site and clear signs of this were visible when this writer visited Banihal in January. 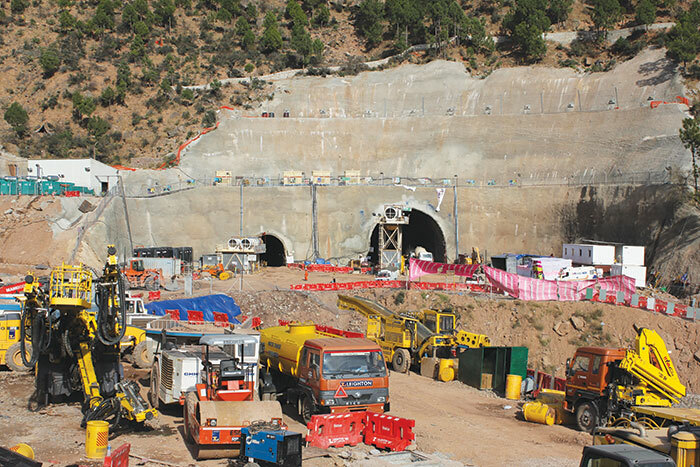 “We have dug through nearly 7.2 km of the 8.5-km tunnel and hope to achieve the breakthrough by blasting the last wall between Banihal and Qazigund by the year-end,” Satyanarayana says. The tunnel aims to provide an alternative to the 2.5-km Jawahar tunnel through the Pir Panjal mountains under the Banihal pass that was commissioned in 1956 and remains closed for weeks in winter due to snow avalanches. It was designed for a traffic of 150 vehicles per day in either direction but more than half a century later more than 7,000 vehicles pass through it every day in both directions. Therefore, a wider and longer tunnel has been planned at a lower elevation. Lower down the hills along the existing Jammu-Srinagar highway, engineers have already dug up a 9-km road tunnel between Chenani and Nashri and are now engaged in finishing the job by putting up supports and installing electrical, mechanical and communication equipment. “The two-lane tunnel with a parallel intermediate lane escape tunnel will be the country’s first tunnel with an integrated tunnel control system (ITCS) of international standards, where the ventilation, fire control, signals, communication and electrical systems will be automatically actuated,” says SC Mittal, chief executive (implementation) of IL&FS Transportation Networks Ltd (ITNL), which has been engaged by the National Highway Authority of India (NHAI) as the contractor of this project. The tunnel will shorten the existing 41-km highway through hilly terrain to an all-weather road of just 10.9 km. It will provide an alternative to the existing two-lane highway, which passes through steep mountain terrains and remains closed for 40 days a year due to bad weather. It will cross through the flyshoid geological formation in the Patnitop range of the Himalayas, skip the Nagroda bypass which truckers find difficult to negotiate due to its sharp and steep bends as well as the treacherous ‘Khooni Nala’ where shooting stones have frequently proved fatal for road users. 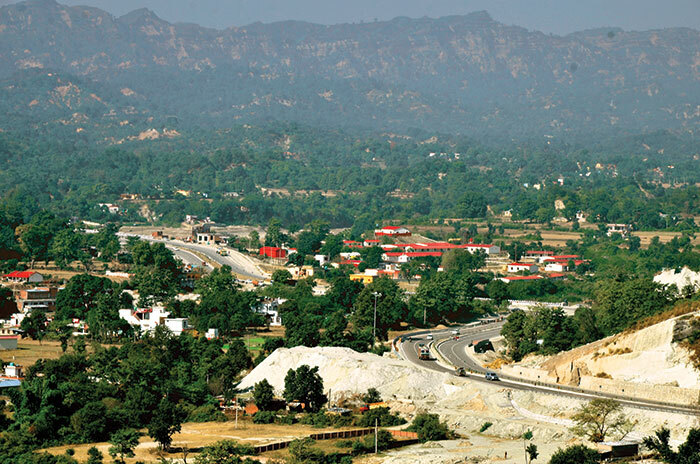 The Banihal-Qazigund and Chenani-Nashri tunnels are part of an ambitious plan of the NHAI to realign, restructure and redevelop the existing two-lane Jammu-Srinagar highway and construct a state-of-art four-lane highway between the summer and winter capitals of Jammu and Kashmir. The new four-lane highway will pass through a dozen tunnels, two dozen viaducts and 150 bridges, cutting down the existing distance of around 300 km by 60 km and the travel time by half. “We are fast-tracking four of the six ongoing projects that were running behind due to the problems of logistics and land acquisition. Work on the two remaining stretches, which initially attracted few bidders due to engineers’ low estimates, has started after new contracts were awarded last September with upwardly revised cost estimates. All the projects are slated for completion by May 2019,” says NHAI chairman Raghav Chandra (see interview). It is not a routine exercise of widening and strengthening a highway – it is about erecting a new roadmap of advanced engineering structures, he is quick to point out. The present route, which is part of NH-IA (now renumbered NH-44), started as the Banihal cart track by Maharaja Pratap Singh of what was then the princely state of Jammu and Kashmir. It opened for traffic on May 1921 with the annual Darbar move from Srinagar to Jammu. Even after construction of the 2.5-km Jawahar tunnel and its development into a two-lane highway at heavy expenditure by the central government, it is treacherous and unreliable. Frequent snowfall during winters and landslides during monsoon and summers keep it blocked for weeks, cutting off the traffic between the Kashmir valley and the rest of India. That is one of the prime reasons for underdevelopment of the landlocked border state. Whenever the highway is blocked, the valley comes to a standstill, with no supplies of even essential commodities. Even at the best of times, it takes 10 to 12 hours of hazardous journey to commute between Jammu and Srinagar. “When all the six projects are finished they will not only provide an alternative, safer, smoother and more fuel-efficient route of communication in this strategically important state but also reinforce the lifelines of economic growth in a region which is plagued by an acute infrastructure deficit, growing unemployment and stagnant agrarian economy,” Chandra points out. With its complex geology, tunnelling in the Himalayas confronts engineers with diverse geological problems such as difficult terrain conditions, thrust zones, shear zones, folded rock sequence, in-situ stresses, rock cover, ingress of water, geothermal gradient, ingress of gases and a high level of seismicity. All these result in increased cost and extended completion period. Indian engineers have demonstrated that they are capable of rising up to the challenge. After initially looking up to foreign experts they have learnt how to do it on their own. 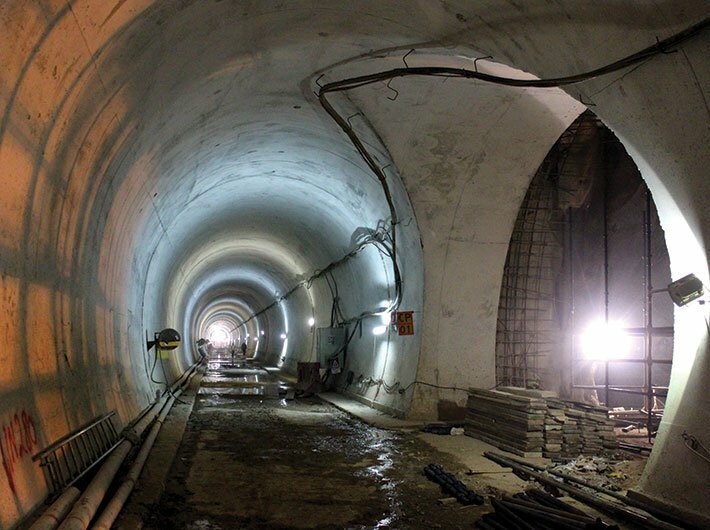 For the 9-km Chenani-Nashri tunnel, for instance, ITNL had initially contracted Leighton India – a subsidiary of Australia-based CIMIC Group, previously known as Leighton Holdings – for design and execution in 2010. However, following a financial dispute, it decided to undertake the project itself mid-way and its engineers finished excavation in a record time of 33 months. Navayuga Engineering Company is constructing the Banihal tunnel with SMEC India, subsidiary of an Australian engineering and development company, as its independent consultant. Originally it was envisaged as a bi-directional, single-tube tunnel with two lanes. Later, it was revised to a uni-directional twin-tube tunnel design, which NHAI found better on technical and safety considerations. “Tunneling through the mountains of Jammu and Kashmir is full of surprises and this project is more complex due to poor rock conditions that vary continuously through mudstone, siltstone and soft sandstone,” says Malcolm Rankin, SMEC’s project manager for underground works. Using the new Austrian tunnel method (NATM) of sequential excavation and support system – considered the most advanced tunnelling technology available in the world – Indian engineers have shown that they can beat the clock despite restrictive working conditions. In the completed Jammu-Udhampur section of the stretch, for instance, four tube tunnels have been opened for traffic in January this year. The old road passing through the Nandini wildlife sanctuary had sharp curves, hairpin bends and steep grades. The new alignment through a series of bridges and tunnels bypasses the curvy road and cuts the distance to 3.6 km. While the full impact of the ongoing works will be visible only after completion of all the six projects, evidence of how this will transform road journey can be seen as one travels through these ‘Nandini tunnels’. Interconnected through a series of bridges and viaducts, they not only cut the travel time and fuel waste but also minimise disturbance to the flora and fauna of the Nandini wildlife sanctuary, a tranquil haven that is also home to several endangered species. Earlier it took two-and-a-half hours to travel between Jammu and Udhampur, and the two-lane highway over the distance of 64 km passed through the lofty mountain terrain and was wrought with blind curves. It now takes 64 minutes to cover the distance. The earlier speed limits were in the region of 25 to 30 kmph. Engineered to have fewer curves, the new highway allows speeds of up to 60 kmph. Clear signs of feverish activity are visible as one drives through the NHAI projects on the highway. Engineers and workers are working 24x7 to meet deadlines in the four ongoing projects (Jammu-Udhampur, Chenai-Nashri, Qazigund-Banihal and Banihal-Srinagar) that are running behind the schedule. Meanwhile, work on the two new projects on four-laning of Udhampur-Ramban and Ramban-Banihal stretches of the highway that were approved by the cabinet committee on economic affairs headed by the prime minister last September as the government-funded projects has started in record time. Meeting the engineering challenges to push up infrastructure deficit in Jammu and Kashmir is no doubt significant. But the real significance of the government’s ambitious plan lies in deploying roads as tools for socio-economic development in a state whose people feel that they have been a getting a raw deal in the national development agenda of the successive union governments. Filling this infrastructure in sectors like road can prove to be the beginning of a larger political project for emotional integration of people and their mainstreaming in the national political ethos. Early signs of this potential are visible during the process of road building itself. Over 90 percent of the workforce engaged by the NHAI concessionaires and contractors tasked with the job is from Jammu and Kashmir and this has substantially contributed to boost the local economy of the area. While engaging local youth, the engineering companies involved have also taken special care to upgrade their skills by organising specialised training to BTech students from NIT Srinagar and other polytechnic institutes in the state. Local drivers have been provided specialised training on Volvo vehicles in Bengaluru and provided employment thereafter.